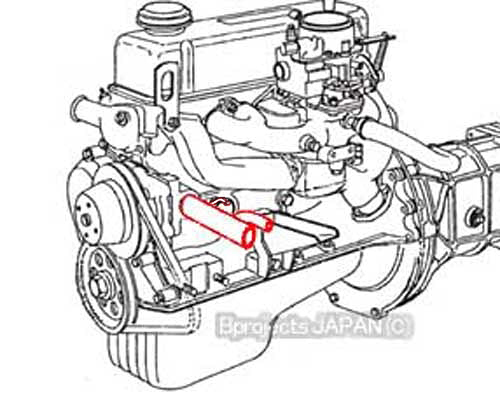 Water Suction Pipe with Heater joint (Late Models) - Specialized shop for Datsun 1200. Available to Late models of A series engine with DFC-306-26/DCZ306-21,22,25(ECC/Carburetor). Original vehicle for replace is fit to Late Sunny truck or VANETTE C22. This water sunction pipe(hose joint) is Nissan genuine. It is Water Suction Pipe with Heater hose Joint/Carburetor Heater hose joint. This water pipe will be can 3 connections to the Lower radiator hose & Heater long hose(from heater core) & Carburetor heater hose. Heater hose joint pipe diameter: 13mm. Carburetor Heater hose joint pipe diameter: 8mm.